Central vein stenosis. 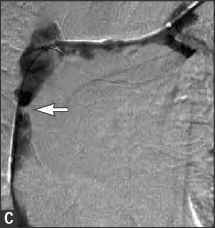 A, Venogram of the central outflow veins performed in a patient with a left upper extremity polytetrafluoroeth-ylene graft and arm edema, B. The angiogram (Panel A) demonstrates complete occlusion of the innominate vein (arrow) with collateral filling in the neck and the chest. The most common cause for stenosis or thrombosis of the central venous system is previous injury from indwelling central vein catheters. Central vein stenosis may not become apparent until an arteriovenous anastomosis is created. This increases blood flow in the outflow veins and may overwhelm a compromised central vein, resulting in the appearance of superficial collateral veins on the neck and chest wall in addition to ipsilateral arm edema. In this example, the occlusion was crossed using an angiographic catheter, and thrombolytic therapy was administered. C, Venography performed after thrombolysis demonstrates severe stenosis of the innominate vein and the superior vena cava (arrow).